Today I have been featured over at Babyhuddle talking about the support that is available when you have your baby prematurely. Unusually I guess, when I had Joseph was not the first time I had been in a neonatal unit. Very good friends of mine back in Australia had a premature baby boy at around 30 weeks gestation when I was in my mid 20s. Similarly to the situation we found ourselves in, they had no family nearby and little support. I visited my friend and her baby often, and was there to see him just a couple of days after birth, looking like a perfect little tiny baby, quite red to look at and so delicate. After that experience I volunteered for an organsiation called Pregnancy Support and did some NICU visiting, and helping women with expressing breast milk for their premature babies. But nothing, absolutely nothing, could have prepared me for having my own little baby, so early, so poorly, in such extreme circumstances. You can read about pregnancy complications and prematurity until you can take in no more, but until you have walked in those shoes, you can't truly comprehend what it is like. One thing that I remembered so clearly was visiting my friend one day, the friend with the 30 weeker, and she was packing up her room. I was confused. She explained to me that she was medically fit for discharge so had to go home, leaving her baby all by himself. I had tears in my eyes. She was stoic, having come to terms with the situation, and quite grateful to get home to her own bed and away from the endless day time that is hospital life. I hung on to that when I found my self, some 14 years on, in the same position. World Prematurity Day is a chance for those of you have haven't walked in our shoes to get an insight into what it might be like. To learn our stories. You never know how our experiences might help you down the track. World Prematurity Day is also a vital chance to talk about the broader picture. 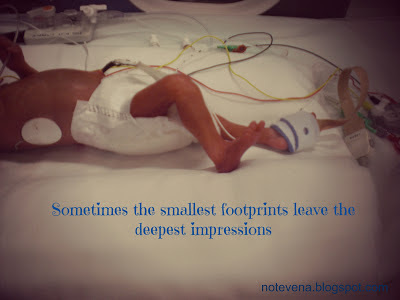 I get so cross when time and time again prematurity is put down as "one of those things". I know we can do better than that. I know there are answers out there, and research and most importatly the application of that research in settings around the UK and around the world is essential. What is also essential is understanding that many of the solutions, particularly in the developing world, are cost free or cheap. And many of the solutions to premature birth solve other health issues as well. Things like encouraging girls not to give birth too young, spacing pregnancies out, good health care etc. I hope you can join me in tweeting, sharing and learning more this World Prematurity Day November 17th.